Things are always different with the second child. When Lindsey Kuhle, head women’s golf coach at the University of Denver, had her son Jordan seven weeks ago, she decided she would cherish her full maternity leave to be with him, however hard it might be to leave the team she has poured her heart into. Kuhle missed just two tournaments back in 2014 when she had daughter Lucy, but this time she took the whole fall season. In the final round of the Golfweek Conference Challenge, the downhill par-3 17th was a big swing hole for Denver. 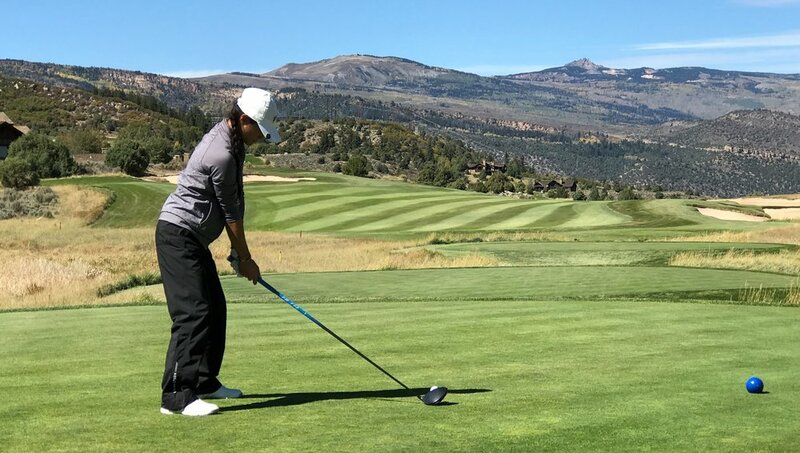 With Kuhle on the sidelines this week, Denver won the Golfweek Conference Challenge at Red Sky Golf Club in nearby Vail, Colo., for the first time in eight years playing the event. Kuhle showed up for the practice round and a subsequent team dinner -- her primary goal was simply to cart the team’s TrackMan from Denver to Vail – but from there, she was restricted to Golfstat reloads. And frankly, that’s what makes this whole thing work. “She’s been super hands off and really lets me do my own thing,” interim head coach Kolton Lapa said. Lapa is in the unique position of having the reins of a Division I program at the young age of 23 (even though most people mistake him for 29 or 30). So far, he’s been a coach that players have rallied around. In terms of children, you might say Kuhle is really a mother to three. She’s so invested in the Pios program, at times it feels like a part of her. Truly, it is her family. Kuhle, 34, played college golf at Tulane. Three months after she graduated in May 2005, she joined then-head Denver coach Sammie Chergo’s program. She has been at Denver ever since, but for a few short months in 2013 she spent as the assistant coach at Georgia (she moved back west to replace Chergo in the middle of that season). Denver ties run deep in Kuhle’s family, too. Her brother John Hulwick was on Denver’s first Division I golf team in 1998. That means that for 16 of the 20 years that Denver has competed in Division I golf, a Hulwick has been involved. When you take a break from that kind of commitment, as Kuhle has this fall, you essentially become a historian. It’s the best way to stay passively involved. “All I do is research,” Kuhle said of maternity leave. In the demanding world of coaching and recruiting, Kuhle hadn’t really thought much about patterns and program history. Now she realizes that the Pios had been building to this week. They have finished in the top five each of the past six years at Red Sky Golf Club. That included a runner-up finish last year. With a major tournament victory, Denver could be on the path to recreating its most successful season. The Pios last went to the NCAA Championship in 2009 and finished fifth that year (it was still a 72-hole stroke play event then) under Chergo’s leadership. That 2008-09 season was also the last time Denver won a tournament outside its own Ron Moore Intercollegiate or the Summit League Championship (the Pios are on a 16-year winning streak in that event). “This is probably our biggest win since that year,” Kuhle said of how the Golfweek Conference Challenge win simulates that 2008-09 season. It could be time that both Kuhle and Lapa truly put their own mark on the program. This roster included Kuhle’s first true recruit as a head coach, Namibian-born Jessica Dreesbeimdieke. She is one of those players who can always put up a number, and was one of Lapa’s two coaching picks in the Pios’ Conference Challenge lineup. She made the coach look good. “Probably the hardest thing I had to do so far is we had to do a coach’s pick for Red Sky and those are always awkward,” Lapa said. Besides Dreesbeimdieke, Denver has a great mix of players that hail from all over the country and the world. There’s also local talent. The Denver area’s own Mary Weinstein was a crucial part of the Pio charge at Red Sky, finishing T-15 individually (she posted 6-under 66 in Round 2). The Pios are more a team of role players than one or two stars with a supporting cast. That dynamic can work very well in team golf, and it’s even better if they get along, as Denver players do. At Red Sky, Denver went into the final round with the lead, and Lapa is most proud of the fact that they never lost it. Stranded without his golf cart as the final groups moved through Nos. 1 and 2 (the final round was a shot-gun start), Lapa was left with little to do but sit in the clubhouse and watch the win unfold on Golfstat. Denver players make this job relatively easy. There are only four Division I women’s golf programs in the state of Colorado, so it’s notable that while Denver spent the week battling at Red Sky, Colorado’s women also scored a long-awaited victory. The Buffs won the Coeur D’Alene Collegiate Sept. 26 after finishing 54 holes at 18-under 834. That put them seven shots ahead of Illinois, a team that won the Mercedes-Benz Collegiate Championship to open its season. The real push came in Round 2 (as in, the second half of an opening 36-hole day). Colorado posted a team score of 16-under 268, which was 11 better than the next-best team (Illinois) in that round. That round and the 54-hole total were both school-record rounds for Colorado. The Buffs haven’t won as a team since winning back-to-back titles in March 2012. Interestingly, it happened within hours of Denver winning in Vail. "We pulled off the win today," Colorado head coach Anne Kelly said. "We probably didn't play our best golf, but I was still really proud of the team and proud of how they hung in there and fought hard." Colorado players Kirsty Hodgkins (10 under) and Robyn Choi (6 under) finished first and second. -Information from the University of Colorado used in this report. Where: Olympic Hills Golf Club, Minneapolis, Minn.
Storyline: This is the fourth year the Annika Foundation has been involved in women’s college golf, and the event feels exactly as you would expect one run by a major golf foundation to feel. The Annika had the strongest field in women’s college golf last season, as determined by the Golfweek/Sagarin rankings, and it will obviously continue that trend. If Annika invites them, they will come. I’ll be watching what Arkansas can do in its first event since tying an NCAA record to win the Mason Rudolph earlier this month, and also to see Texas and Stanford get some of their world-beaters into the lineup this week.